The paper presents some reflections and activities developed by researchers and teachers involved in teacher education programs on cultural transposition. The construct of cultural transposition is presented as a condition for decentralizing the didactic practice of a specific cultural context through contact with other didactic practices of different cultural contexts. We discuss the background theoretical issues of this approach and also give an analysis of two examples of cultural transposition experiences carried out in Italy. In particular, by means of qualitative analysis of some excerpts, discussions, and interviews, we show that the contact with different perspectives coming from China and Russia fostered educational practices and reflections on whole number arithmetic education. Ramploud, A. (2015). 数学 [shùxué] matematica, sguardi (d)alla Cina, Ph.D. Thesis, University of Modena e Reggio Emilia (Italy). https://morethesis.unimore.it/theses/browse/by_autore/r.html. Accessed 20 Dec 2017. Sun, X., Kaur, B., & Novotná, J. (Eds.). (2015). 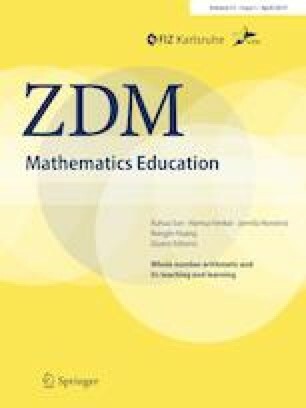 Conference proceedings of the ICMI study 23: primary mathematics study on whole numbers. http://www.umac.mo/fed/ICMI23/doc/Proceedings_ICMI_STUDY_23_final.pdf. Accessed Dec 2017.